From skyscraper lined riverbanks and the Skokie lagoon, to the gritty Chicago Sanitary and Ship Canal, WTTW's Geoffrey Baer examines the history, lore and stunning views of the Chicago River. Tune in to see cameos by Chicago's First Lady, Lady Grebe and Captain Bob Agra! DON’T MISS THE BOAT - FINAL DAYS TO CRUISE! Our last day on the water is Sunday, November 19th. Warm up in our heated salon with hot beverages including Hot Spiced Cider and Peppermint Schnapps Hot Cocoa, and sit back in wonder as passionate CAF docents bring Chicago's architectural legends to life. CONGRATS TO OUR PHOTO CONTEST FINALISTS! See top photos from our 5th annual Cruise Chicago Photo Contest, plus cast your vote on Facebook for our “People’s Choice” prize. Chicago’s Leading Lady was transformed into a luxurious dinner party for 13 complete with furnishings from Kehoe Designs, gourmet seated dinner from Entertaining Company and a curated wine list. BOOK YOUR FALL CHARTER AND CHOOSE YOUR UPGRADE! Autumn is the perfect time to charter a private yacht. Book your 2017 fall charter and receive a complimentary upgrade of your choice: skyline commentary, champagne welcome toast or $100 per hour savings on charter rental rates. Share your best 2017 summer cruise photos for the chance to win a luxury weekend with a private Lady Grebe cruise, a stay at The Peninsula Chicago and more! Join us for an invigorating fitness experience on the Chicago River! Tickets include a 60-minute instructor-led yoga session, green juices and stunning morning views. First cruise Sunday, June 25th. CHICAGO RIVERWALK SEASON OPENING IS SATURDAY, MAY 20TH! Celebrate with businesses along the Chicago River at the Chicago Riverwalk Season Opening. Activities include free kids admission all day on Mercury Cruises, pre-season Mercury Canine Cruise, a fish puppet parade, Dragon Boat Exhibition Race and more. 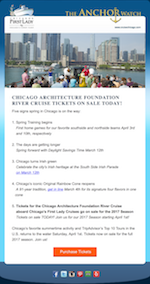 Join us for a Chicago Architecture Foundation River Cruise aboard Chicago’s First Lady Cruises or plan your private event on the water. For parties of two to 250, we have a vessel perfect for your group! OPENING DAY IS SATURDAY, APRIL 1ST! Plan your outing on the water with the city’s favorite tour, the Chicago Architecture Foundation River Cruise aboard Chicago’s First Lady Cruises. Public tours and private charters kick off the season this Saturday, April 1st. CHICAGO ARCHITECTURE FOUNDATION RIVER CRUISE TICKETS ON SALE TODAY! Corporate team building events build trust, encourage communication and increase collaboration. Invest in your employees with a day out of the office with these unique team building activities. Many a local will tell you it is the promise of Chicago summers that gets them through these dreary winter days. Here are 12 summer happenings we’re looking forward to in 2017.